Photograph of E & H’s team volunteering at Feed My Starving Children. 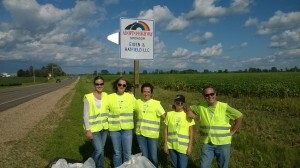 E & H’s crew cleaning up their section of highway 29. The Eiden & Hatfield, LLC team strives not only to provide outstanding legal services, but also to be upstanding community members. Our team is active in a variety of organizations throughout the community including Rotary, Mind Over Matter (M.O.M. ), Inc., Junior Achievement, the Chamber of Commerce and Stepping Stones of Dunn County. 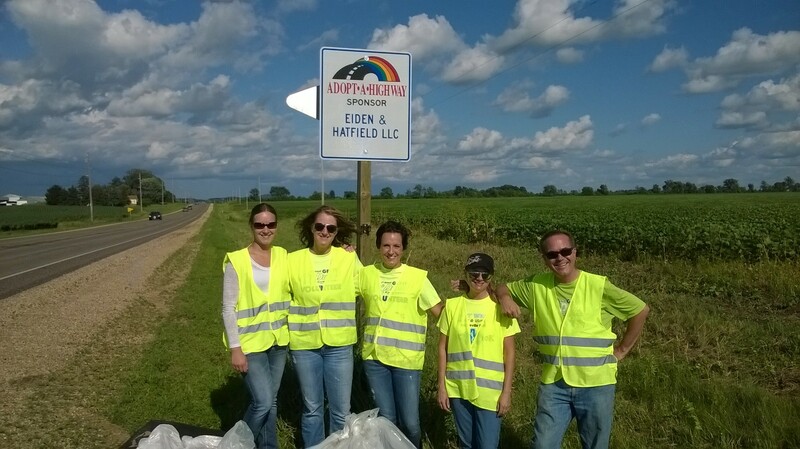 Eiden & Hatfield, LLC is also a member of the Adopt a Highway program, which allows the E & H team the opportunity to meticulously maintain a two-mile stretch of a local highway. Firm members also volunteer on the board of Dunn Energy Cooperative’s Operation Roundup and at activities such as Kids Against Hunger and the Get it Dunn Run. 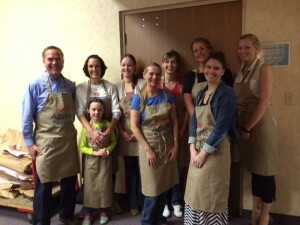 Rotary Club of Menomonie: “Service Above Self” ensures that the members of Rotary Club of Menomonie become better citizens through personal and professional development. For more information on the Rotary Club of Menomonie click here. Mind Over Matter (M.O.M. ): M.O.M. was established as a non-profit organization with a purpose to encourage “personal wellness” and “community betterment.” M.O.M. encourages participation in running races & other fitness events in commemoration of Kathleen Fisher’s memory and spirit. In an effort to serve the community and “pay it forward,” M.O.M. gives back through the Kathleen Fisher Memorial Scholarship and its Community Outreach funds. For more information on M.O.M. click here. Junior Achievement: Junior Achievement is an organization that strives to inspire and prepare local youth for success. Junior Achievement provides in-school and after-school programs to students with a focus on entrepreneurship, financial literacy and work readiness. For more information on Junior Achievement click here. Stepping Stones of Dunn County: Stepping Stones is a non-profit organization whose mission is to prevent hunger, homelessness and isolation in the region. Stepping Stones is comprised of three programs, The Food Pantry, Stepping Stones Shelters and the Community Connections Program. The impact of Stepping Stones is felt throughout the region, with over 1.2 million pounds of food distributed in 2014. For more information on Stepping Stones of Dunn County click here. Operation Round Up, a program sponsored by Dunn Energy Cooperative: Operation Round Up has awarded nearly $250,000.00 in grants to local schools and organization. These donations have helped fund numerous community projects and promotes the Cooperative’s initiative of serving the community. For more information on Operation Round Up click here.